Dr. Michael L. Blakey led the analysis conducted by the Howard University’s team of physical anthropologists. The Howard team discovered, after years of analysis and historical and genetic research, a plethora of information about 18th century slavery in New York City – a subject that not been well documented in the past. They found that there was a distinction between African born and American born slaves. The skeletal remains showed some individuals with filed teeth in hourglass shapes, which is a cultural tradition prevalent in West Africa.15 Several female burials indicated rings on the base of the skull due to carrying heavy loads on their heads, another West African tradition. Infant mortality was extremely high—approximately 40% of the burials were infants. Despite the racial injustices that resulted from slavery, the burial ground exemplifies that Africans were able to preserve their cultural practices. The alignment and spatial placement of the graves illustrate religious practices and familial associations. The burials were aligned in an east-west orientation, analogous to the belief that when the dead rose their heads would be facing the rising sun.18 Some of the women were buried with infants and stillborn children. There were a number of grave goods buried with the remains including glass beads, shells, pocket knives, and tobacco pipes. Since documents about slavery in the North during the 18th century are scarce, the African Burial Ground serves as an important reminder that slavery was prevalent in all the colonies. The 419 burials were reburied on October 4, 2003. In October of 2007, a memorial was opened at 290 Broadway designed by Rodney Léon. An interpretive center on the ground floor of 290 Broadway showcases five public art projects funded by GSA through their Arts and Architecture Program. The African Burial Ground does have landmark status protection. In 1993, the African Burial Ground and the Commons Historic District were designated a New York City Landmark. During that same year the African Burial Ground was designated a National Historic Landmark. Then, in 2006 the African Burial Ground was designated a National Historic Monument. The current site of the African Burial Ground consists of the Ted Weiss Federal Building at 290 Broadway, which holds an interpretive center on the first floor for the burial ground. The center features five public artworks commissioned and funded by the General Services Administration. "Unearthed" by Frank Bender, sculptor and forensic artist, is a bronze sculpture inspired by three of the individuals removed from the burial ground. "America Song" by Clyde Lynds is a sculpture composed of granite, concrete and fiber optics, and features an Indian headdress and feathers. At night, the sculpture is illuminated by the fiber optics. The other public artworks include "The New Ring Shout" by Houston Conwell, "Africa Rising" by Barbara Chase-Riboud, "Renewal" by Tomie Arai, and "Untitled" by Roger Brown. The 419 burials were reburied in the location they were originally discovered, adjacent to the 34-story building. An African Burial Memorial designed by Rodney Léon was placed over the burial ground. Composed of granite, the memorial features seven design elements: Wall of Remembrance, Ancestral Pillars, Memorial Wall, Ancestral Chamber, Circle of Diaspora, Spiral Procession Ramp, and Ancestral Libation Court. 1992: President George H. Bush signed a law officially stopping the project to excavate the graves at the African Burial Ground. 1993: African Burial Ground and the Commons Historic District are designated a New York City Landmark. 1993: African Burial Ground is designated a National Historic Landmark. October 4, 2003: The remains of the 419 slaves from the African Burial Ground were reburied on the location where they were discovered. 2006: African Burial Ground is designated a National Historic Monument. 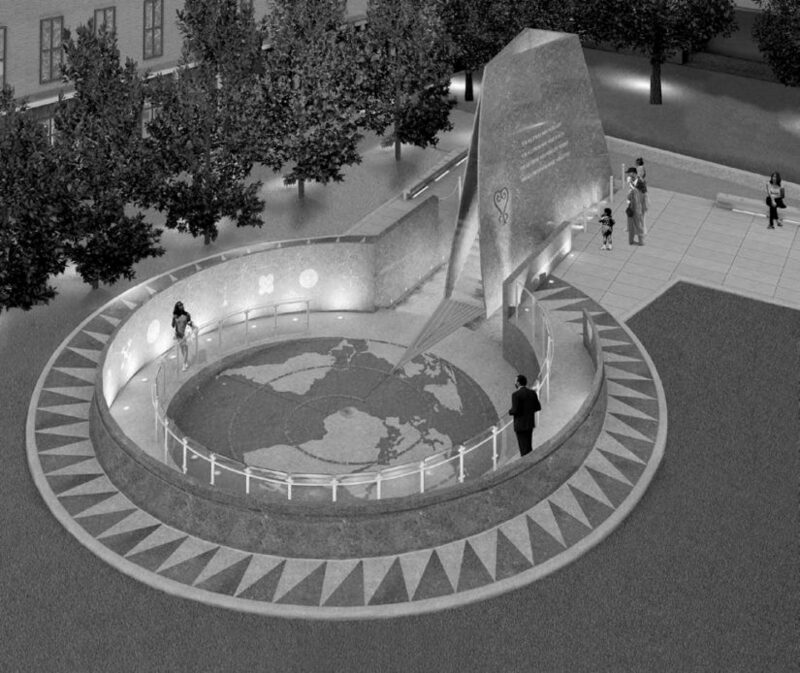 October 1, 2007: The memorial for the African Burial Ground site was completed and opened for visitors. The rediscovery of the African Burial Ground in 1991 revealed illuminating information about a time in history less documented in terms of slavery in the northern colonies. The preservation and interpretation of the burial ground has endured heated debates among descendants, preservationists, and politicians due to the construction that threatened to desecrate the cemetery. By 1991, HCI discovered several well-intact burials. Historically, City commissioners filled the area with soil and rocks that had inadvertently protected the burials from future impact. In October of 1991, GSA held a press conference to release the discoveries of the burial ground. William Diamond, head of GSA, ensured the public that the safety of the burial ground was the top priority of the project.23 Due to the discovery of the burials the memorandum with ACHP was amended in August 1991, however GSA continued removing burials. emerged against the removal of the burials. As the African American community became aware of the discovery, and HCI continued excavating the remains, they grew concerned about the methodology of the project. 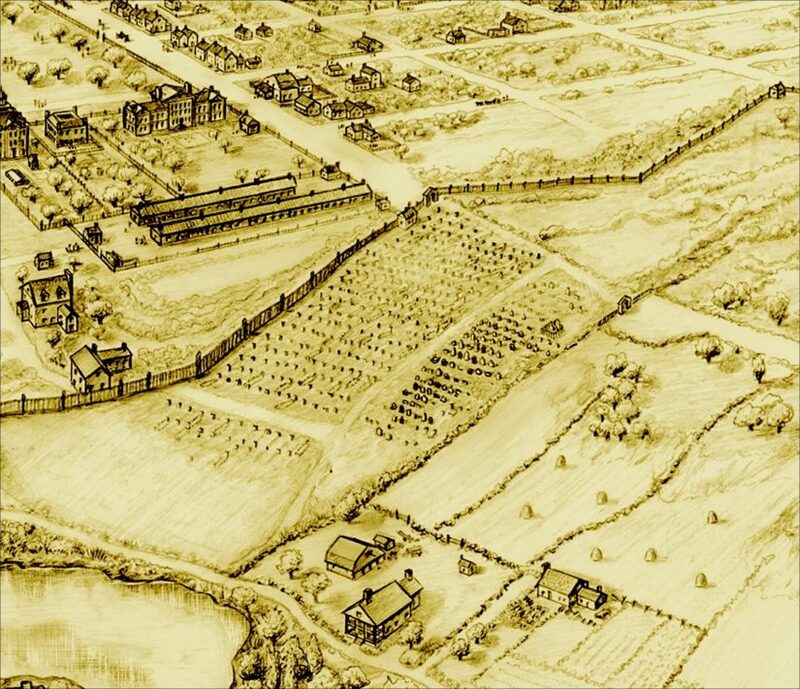 The consensus among the descendants and preservationists was that excavation should stop, the burials should be re-interred, and a memorial should be implemented at the site.24 However, dispute arose over whether the skeletal remains that had been removed should still be analyzed or immediately reburied. Another objection to GSA’s methods was the lack of an African American presence during the excavation process. Federal guidelines stipulated that the descendants of the burial ground should be included in all of these processes.25 Mayor David Dinkins, the first African American mayor in New York City, instigated a coalition of local politicians including Senator Paterson (later Governor of New York), African American activists, and preservationists (such as the Municipal Art Society and the NYC Landmarks Preservation Commission) to address the concern over how the burial ground excavation was being facilitated. Meanwhile, GSA grew weary of the escalating development costs posed by the discovery, and the long process of excavation (3 to 5 days per burial). They enforced HCI to work longer hours; the archaeology team began working a grueling schedule of 12-hour days, 7 days a week. It was also recommended that the team switch to a shovel excavation style in order to expedite the removal. When Senator Paterson caught wind of this change, he alerted the New York Times and formed a task force to supervise the excavation.26 HCI never switched to this method and continued the careful, meticulous removal. In February 1992, trouble arose when a backhoe accidentally destroyed 20 burials; HCI had been using an outdated map denoting the area as sterile.27 The analysis of the remains at Lehman College was also criticized because analysts were using newspaper to wrap the bones when acid free tissue paper was recommended as more appropriate. Jennifer Raab, then New York City Landmarks Preservation Commission Chair, criticized HCI and GSA’s research design plan because it lacked organization, and had not been changed since the initial discovery of the burials. Edward Rutsch, head of the HCI archaeology team, resigned from the project due to mounting opposition, and acknowledged that the burial ground had become too large for his small firm to handle.29 GSA hired John Milner and Associates to replace HCI because they had experience excavating two major African American cemeteries in Pennsylvania. However, the African American community began holding public meetings in opposition to the burial ground excavation. They also held spiritual ceremonies on the burial ground site and at Lehman College. By June 1992, 390 burials had been recovered with a plan to remove an additional 200 graves.30 Mayor Dinkins sent William Diamond of GSA a letter requesting that the excavation of the burial ground be stopped. Diamond rejected Dinkins' request citing that he had complied with federal regulations and would continue moving forward with the project. Gus Savage, an African American congressman from Illinois and the head of the committee that oversaw the federal agency for the project, held a congressional hearing on the project.31 He informed GSA that funding would be stopped for the project. Several days later, President George H. Bush signed a law officially stopping the project. In order to implement a new research design plan, GSA created an advisory panel of historians, archaeologists, members of the descendants, and local politicians. The panel decided the burials should be analyzed at Howard College in Washington, D.C., and once the analysis was completed, the 419 burials would be returned to the burial ground.32 They also agreed that a memorial and an interpretive center should be created for the site. In 2006, the African Burial Ground was designated a National Historic Monument. Gale Harris, Jean Hawson and Betsy Bradley, “African Burial Ground and the Commons Historic District Designation Report,” NYC Landmarks Preservation Commission, 1993. Spencer PM. Harrington, “Bones and Bureaucrats: New York’s Great Cemetery Imbrogolio,” Archaeology Magazine, March/April 1993. Anne-Marie Cantwell and Diana diZerega Wall, “‘We Were Here’: The African Presence in Colonial New York,” in Unearthing Gotham: The Archaeology of New York City (New Haven: Yale University Press, 2003), pages 277-297. Ned Kaufman, “Heritage and the Cultural Politics of Preservation: The African Burial Ground and the Audubon Ballroom,” in Place, Race, and Story: Essays in the Past and Future of Historic Preservation (New York: Routledge, 2009), pages 296-308. “Return to the African Burial Ground: Interview with Physical Anthropologist Michael L. Blakey,” Archaeology Magazine, 20 November 2003. Anne-Marie Cantwell and Diana diZerega Wall, “‘We Were Here’: The African Presence in Colonial New York,” in Unearthing Gotham: The Archaeology of New York City (New Haven: Yale University Press, 2003), p. 290. “Draft Management Recommendations for the African Burial Ground,” National Park Service U.S. Department of Interior. David W. Dunlap “African Burial Ground Made Historic Site,” New York Times, 26 February 1993. Randy Kennedy, “Gray Skies Match Mood at Reburial,” New York Times, 5 October 2003. Jennifer S. Lee, “African Burial Ground Memorial to Open on Friday,” New York Times, 1 October 2007. Anne-Marie Cantwell and Diana diZerega Wall, “‘We Were Here’: The African Presence in Colonial New York,” in Unearthing Gotham: The Archaeology of New York City (New Haven: Yale University Press, 2003), p. 294.